After graduating from the Dutch Film Academy in 1997, Peter Alderliesten began his career as editor of fiction films, chiefly features and their respective trailers, often in cooperation with editor Herman Koerts in Amsterdam. Since then he worked with a number of major film directors in the Netherlands: His individual editing credits include "In Orange", "Phileine zegt Sorry" (best editing award Dutch Film Festival), "Minoes", "Drift", "Total Loss". "The Stratosphere Girl" is his first international feature. After completing his studies in Berlin in 1992, Michael Mieke began his professional career as a cameraman for short films, music videos and commercials. The interplay between the script and its visual interpretation became a determining factor in his work. He used the synergy produced by these two cinematic elements to develop his own style over the course of some very diverse projects. In his first feature film, "Freunde" (Director: Martin Eigler), he took the oppressiveness and suffocating closeness of the big city as the underlying concept for his visual realization. By contrast, his second feature, "Baby" (Director: Philipp Stölzl) was influenced by the vastness of its setting, which prompted him to shoot it in Cinemascope. The idea of disengaging the images from the classical narrative drew the action and characters together and gave the film its concentrated atmosphere. 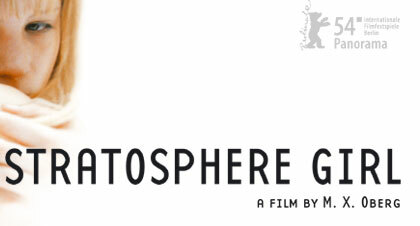 His third feature, "The Stratosphere Girl" (Director: M.X. Oberg), which is being presented at the Berlinale 2004, is his first international theatrical film. Based in New York and at home in Europe and the United States, Petra Barchi has become a well-known name in the indie filmmakers' scene. One of her first projects was "Hurricane Streets," which garnered several awards at the Sundance Festival in 1997. She also collaborated with Jerry Schatzberg on his film "The Day The Ponies Came Back" and worked with the prominent Japanese director Isako Matsui on "Solitude Point" as well as with Pan Nalin on his "Samsara." From feature films to television productions and music videos, Petra Barchi delivers highly original concepts in every genre. Sandra Fuhr is a young and promising costume designer based in Cologne. Having spent 10 years as wardrobe supervisor and costume assistant on numerous film productions she began her career as a freelance costume designer in 2001. Her first feature films as designer the two innovative German productions "Elefantenherz" and "Do Fish Di It", were nominated and won awards at several film festivals. With "The Stratosphere Girl" she has now completed her first international film. Born in Treviso, Italy, Laura Schiavo-Loz moved to Melbourne, Australia, where she trained as a hair stylist and make-up artist. She has been living in London for nine years now, from where she travels to production sets around the world. Her credits include: "Distant Bridges", "Heartlands" and more recently "Pirates of the Caribbean", "The Last Samurai" and Oliver Stone's "Alexander". Graphic artist Ann-Kathrin Otto learned her craft as a scenery painter at the Bonn Opera. Since her graduation, she has been working for international feature film productions such as "Rembrandt van Rijn," "The Little Vampire" and "The King Dances." In 1999/2000 she attended the well-known Production Design Workshop at the International Film School in Cologne and worked as production designer on the feature film "The Year Of The First Kisses" in 2001. Ann-Kathrin Otto has expanded her field of activity as a storyboard artist and film illustrator ("Boat Trip," "Do Fish Do It" etc.). In "The Stratosphere Girl" she created the style of the characters drawn by the lead actress. The Norwegian trumpet player, composer and producer connects visible stylistic extremes – jazz, ambient, house, electronic and breakbeats – and effortlessly melts them into convincing soundscapes of deep intensity. Born in Sula, Norway, in 1960, Nils Petter was introduced to jazz at an early age by his musician father. He left Sula in 1979 to study music at the conservatory of Trondheim, where he developed his unique style and started to gain a reputation as one of Norway's emerging new talents. His interest in both acoustic and electric music is confirmed in the way he handles the conventions of pop, rock and funk, alongside those of modern jazz. These unique sensibilities soon established him as a much sought-after musician in Oslo. After his intermezzo with the Norwegian jazz combo Masqualero, Nils Petter was introduced to Manfred Eicher, who integrated him into his cast of musicians and studio sessions with ECM artists. In 1997 Nils Petter completed his debut album as a leader with "Khmer," which focuses on a previously unknown blend of improvisation and hypnotically spinning beats. It received extraordinary public and media response, and was honored with the German Record Critics Award and a Norwegian Grammy. Nils Petter composed and recorded the original score exclusively for the feature film THE STRATOSPHERE GIRL in summer 2003. PANDORA FILM was founded in 1981 by Karl Baumgartner and Reinhard Brundig. The company established itself as distributor in Frankfurt and became a leading production company of international arthouse movies. In 1997 PANDORA FILM Produktion was founded as production division based in Cologne. Their aim is to cooperate continuously with writers and directors who develop their own and unmistakable cinematic language.